Make informed investment backed by Yardi Matrix analytics - the industry's most comprehensive market intelligence available today. Our monthly summary of rental market conditions, powered by our stratified monthly sample survey of representative properties. 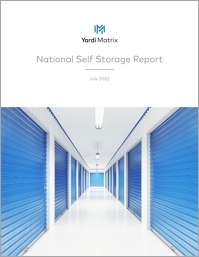 Our monthly national summary of new and growth supply and new and growth rent in the self storage industry. 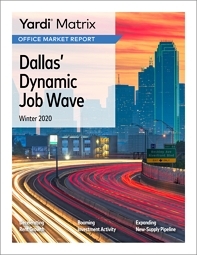 Our monthly national report on the office property market featuring Matrix's U.S. office data - including leasing, development trends, transactions and more. After being largely bypassed by institutional investors for decades, the industrial sector has attracted new interest in recent years. The sector just posted its second year of record performance across key indicators and is heading for an even stronger 2018. 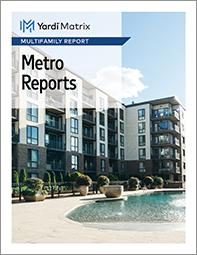 Although the recovery is starting to show signs of strain and market players are increasingly gaming out downside scenarios, 2019 should be another good year for the multifamily industry. Demand is expected to stay healthy as long as job growth remains positive and young adults and retirees choose apartments. A comprehensive metro-level summary, powered by the Yardi Matrix database, consisting of all office properties 50,000 square feet or more. Hurricane Harvey slammed into Houston on August 25 producing a swath of flooding in low-lying developments and areas near rivers, lakes and reservoirs. The flooding damaged tens of thousands of single-family residences and apartments, commercial properties, vehicles and infrastructure. The storm might end up as the most expensive natural disaster in U.S. history, with property damage estimates upwards of $100 billion. Click here for product news, upcoming events, interviews and for presentation materials from past events. Concerns about rising interest rates and weakening economic growth have led to a slowdown in commercial mortgage originations, particularly in out-of-favor asset types, despite the wide availability of debt capital. Please feel free to reach out to us and we’ll be happy to show you a better, faster and more effective way to manage and support your entire investment platform. 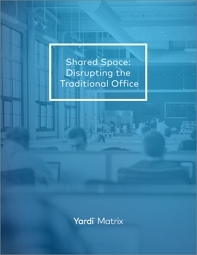 With information and data only available in Yardi Matrix you’ll see an immediate improvement in your information needs.